An Indian woman is very much possessive about her kitchen and most of the time spent by her is in the kitchen preparing all sorts of tasty dishes. Kitchenware refers to all appliances, bakeware, utensils, cutlery, cookware, dishes and so on which are used in the kitchen. In India, kitchenware market is entirely motivated by its functional requirements and there is an enormous scope for market development. Health conscious people are very pleased to have products like non-stick cookware and anodised cookware which seals the base metal from getting into the food and uses a very negligent amount of oil for cooking. For eating purposes also these mindful healthy people opt for cutlery made up of glass, ceramic etc. A market survey report shows that the cookware market for aluminium and non-stick utensils increased by 60 percent in the United Kingdom but in India it is likely to grow steadily. Kitchenware industry in India grows annually at a rate of 40%. A kitchen hood has become popular and is required while cooking food to avoid smoke and the pungent fragrance of the spices. The revenues generated by the kitchen hood market in India goes up to a compound annual growth rate (CAGR) of 9.9 percent achieving an amount of US dollar 183.3 million by the year 2017. Over the last few years, Indian pressure cooker market is proposed to be between Rs 1300 to Rs 1400 crore and the CAGR shows a 10% hike. In the coming years kitchenware market will show remarkable growth because of the increase in the standards of living which changes the way of looking at our kitchens, keeping an eye on the ecological concern, attractive models yet useful kitchenwares. 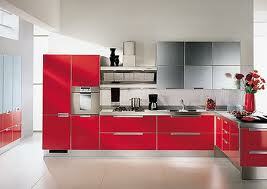 Modular kitchens attaches a feel of glamour to your kitchen interiors.